Apparently Steve Martin came up with this idea while filming Bringing down the House, having had the misfortune of seeing that particular film I fully understand how letting his mind wonder might have seemed a huge blessing at the time. Samir Horn (Don Cheadle) is a devout muslim who was born and raised in the Sudan. When he was young his father was killed in a car bomb while he watched, I can’t work out if this makes the fact that he grew up an explosives dealer ironic or just strange. A great deal of the mystery and suspense in Traitor is working out if Samir is actually betraying anyone, and if so whom. When thrown into prison in the film he doesn’t sell any of his fellow inmates out for freedom even though one of them, Omar, blames him for their capture. After finding freedom Samir finds himself as a person of interest under the watchful eyes of the FBI team lead by Agents Clayton (Guy Pearce) and Archer (Neal McDonough) and under the control of Agent Carter (Jeff Daniels). No-one can seem to pinpoint whether he is mildly guilty bystander with nefarious amigos, a callous and vicious criminal mastermind behind a plot to detonate 50 bombs simultaneously all over the continental US, or something else altogether. Even his wife and family have no clue where his loyalties lie. What is undeniable is the fact that Samir is now buddies with some hard-core extremists who feel that the best way to draw attention to their cause is to blow some innocent Americans into tiny bite sized chunks. So Samir is for much of the film a mysterious enigma with many connections and figurative fingerprints everywhere that impel both parties to investigate who is this guy and whose side is he on? The story unwinds and develops in many countries in Africa, Europe and North America, Cheadle and Pearce come face to face a couple of times, generally in less than ideal circumstances. And all the while the deadline to a massive terrorist attack edges ever closer. 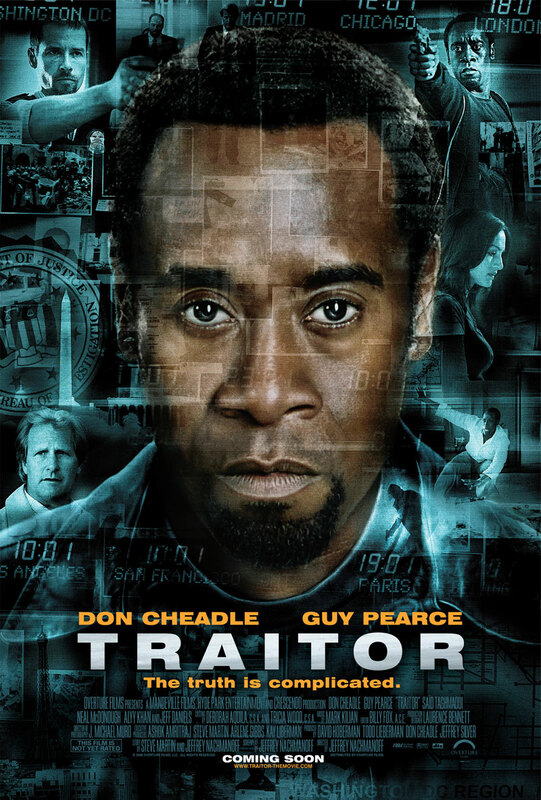 Traitor is pretty good stuff, action is largely shelved to make way for an intricate plot, and the acting is top notch. This is Cheadle’s film, but Guy Pearce does what he can with a pretty dodgy Southern US accent and McDonough is memorable in what could have been an underdone role. But the strongest role in the film is that of Said Taghmaoui as Omar, who proves he is far more than a guy with a low scrabble score for a name. I’ve seen Taghmaoui in a few films – usually playing ‘that middle-eastern guy’ – and he always sticks out as someone to watch, hopefully he gets to be a leading man in a film where his ethnicity is irrelevant. Until then he has to take comfort in the fact that he has already amassed a quality body of work, and that after stealing scenes in Spartan and Three Kings, he is a significant factor in making Traitor a solid piece of work. Final Rating – 7 / 10. A low key but quality drama, with a typically excellent central performance by Cheadle.